In the eyes of the law in the UK, a 10-year-old can be held responsible for their criminal actions. 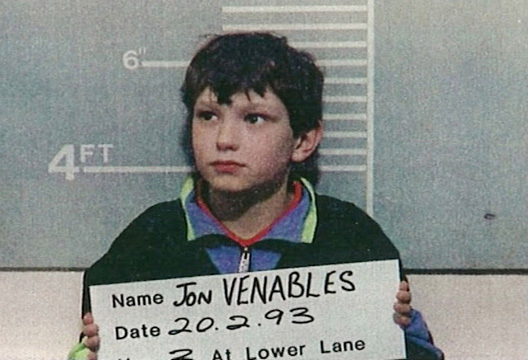 When Jon Venables and Robert Thompson were arrested and charged for the murder of James Bulger in February 1993 they had just turned 10, making them among the youngest to be tried for murder in British history. It was a case that shocked the nation and many documentaries have since been aired detailing the horrific accounts of that day. I wondered if Channel 4’s documentary ‘The Bulger Killers: Was Justice Done?’ would be any different. I was pleasantly surprised and gripped early on, with the main focus of the programme being the contentious debate as to whether the defendants could be, aged 10, deemed criminally responsible for their actions and therefore tried as adults. The boys still sound harrowingly young on the audiotapes recorded during their police interviews. Viewers heard the boys at first deny their involvement in the murder, but later go on to describe their crimes in detail. When the trial began, nine months later, those present heard the boys described as ‘persistent truants’ with behaviour deemed ‘problematic’. They had already been plastered as ‘evil’ and ‘touched by the devil‘ across many media tabloids. While this type of reaction makes sense at an emotional level it doesn’t fit with a fair and impartial criminal justice system. This extensive media coverage sparked Thompson’s solicitor, Dominic Lloyd, to argue that as a result of the widespread reporting, the jury could be prejudice, rendering the trial unfair. However, the judge ruled that this would not influence the trial and it continued as planned. One thing that was striking throughout the documentary was the way in which public opinion, namely animosity fuelled by the media, was able to permeate the whole case. Less than a year after the trial ended, there was a murder in Norway that echoed aspects of the Bulger case. A five-year-old girl had been found dead, killed by two six-year-old boys. The way in which this was approached was starkly different to that of the Bulger case. In Norway the age of criminal responsibility is 15-years-old. The children were never named and photos were never released to the press. They were never arrested. Instead they were enrolled at kindergarten with close follow up from involved professionals. Child psychologist, Tron Andreassen, who was involved in the case, spoke about the brain and how it is restructured during puberty. Only then do the frontal lobes begin to function in what he describes as an ‘adult way’. He suggests that the boys may have been able to understand the difference between what is right and what is wrong, but that children do not have the brain or the psychology to be able to take full responsibility for their actions. When Tron was asked if there were people out there that would dispute that science, Tron quite confidently states 'no – that’s a fact'. Aside from Tron Andreassen, who commented on the Norwegian case, no child psychologist or other mental health professional was interviewed with regards to the Bulger case, which would have been refreshing against the solicitors, police detectives, politicians, newspaper editors and journalists who were interviewed. One pertinent statement that stayed with me was that from journalist Blake Morrison who asked, how would you feel if you were to be tried by a jury of 10-year-olds? The documentary crudely demonstrated the way in which public emotions and media frenzy can pervade the criminal justice system and was a disturbing reminder of the issues at the heart of the Bulger murder case. Whilst it is impossible to concretely answer the question of ‘was justice done?’, it certainly re-sparks the debate as to how we treat children in the criminal justice system. The overwhelming message that I took away from this documentary was that as a country, we are very much still led by public demand and emotional arguments on this debate and perhaps we may consider looking towards other countries to herald a new, more reasoned approach to how we treat juveniles in the criminal justice system with consideration of brain development and psychology. - Rebecca Fellows is an Assistant Psychologist with the Infant Mental Health Service, Leeds Community Healthcare NHS Trust.